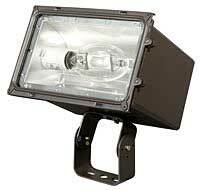 The AccuFlood EF Series from Juno Lighting Group is a smaller version of larger lights with the same wattage capabilities. This compact floodlight can accept lamps from 70W to 400W, from metal halide to high-pressure sodium. It also has the capacity for a full range of ballasts, including HPF ballasts for low temperature starting. The fixture gaskets are made with silicone rubber to withstand high temperatures and the series is certified UL for wet locations.